This is the truck Gordon was driving when he invented Gord's. This truck had just came out of the truck wash and after 21 days in the Oil Fields it just washed clean. By Soaking (0000) Steel Wool with Gord's™ Polish, in minutes we simply scrubbed off years of Oxidation and Corrosion from the Aluminum, (Not hours with the Bars of Rouge and high speed buffers. )To do the whole Peterbuilt it took 2 shop rags to polish, 4 towels to remove haze, 4 pieces of (0000) Steel Wool, and about 40 oz. of polish. Truck Driver size available -- NEW 1-Gallon Size. The Sealer will last for months; Drivers will never have to pay Hundreds to have their tanks polished again. Go to our LINKS page and scroll down for tips and more before and after Pictures. Use Gord's™ Polish/Sealer to Clean, Shine, Protect, and give ALL Metals a UNIFORMED Shine! Your smooth Aluminum will look like Chrome/Stainless, and any corrosion will be gone! 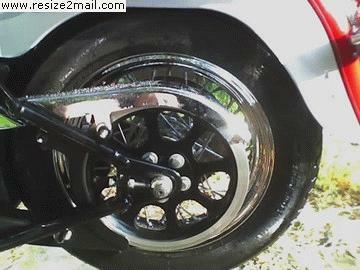 Gord's™ Cleaner - Polish - Sealer is Motorcycle & Classic Car Owner Preferred! Gord's™ polishes Motorcycles, New Auto's, Trucks, Semi's, & Boats. Protect your Aluminum Wheels, Tanks, Mirrors, Fiberglass, Brass, Stainless Steel, & More. Consumers prefer Gord's™over Mothers, Meguires, Blue Magic, Extreme, Green Magic, Blue Metal, Smokin Joe's, Zephyr Pro40, Eagle One's - Never Dull, Wenal, Busch, White Diamond, Wizard's, Hollywood's Shine, & Long Haul. Sealer has lasted for up to 1 year and counting! **One Product** To Polish & Seal for a Long Lasting PROTECTED & PROGRESSIVE Shine! Purchase 2 cases of the 16oz size Gord's Aluminum< Chrome, Cleaner, Polish, Sealer in 1 from the website order products page and you qualify to become a distributor for your area. Call for area availability. We will list you as a dealer of Gord's Aluminum Chrome Polish Sealer after qualifying purchase, and per your request. Call 1-361-643-3998 This will entitle you to purchase products at wholesale prices. Resale certificate required for tax free purchases shipped in Texas. Gord's™ Polish/Sealer all in 1 is a Soap Based Polish, and is 15 times less abrasive than rouge based polishes. It uses a soaking process to allow the cleaning agents to soften and loosen dirt and corrosion. Wet the rag repeatedly with Gord's™, and you will see corrosion melt right away, using the soaking and rubbing method. Using this method and (0000) Steel Wool helps the years of corrosion and dirt Disappear even faster! The Wetter the Better! Then polish your metals to a mirror shine, and let it dry completely for a strong, sealed shine that lasts! With a 99% success rate for taking care of trouble spots where other polishes have failed, Gord's™ Polish/Sealer gives you the best results! How many other Polish Manufacturers can you call and the owner will tell you how to restore your aluminum to like new condition? Gord's™ WILL NOT harm Anodized, Clearcoating, Gelcoat, or Chrome Plated Lexan Plastic. It removes the Stains EVERYTIME! Gord's™ Aluminum|Chrome Polish/Sealer also will not freeze in the winter. Neither Heat nor Cold affect Gord's™ Polish/Sealer. Although the liquid content will expand and contract, it will not freeze or lose its powerful cleaning, polishing, and sealing effects. The shelf life is 2 years plus. Last winter, truck Drivers would apply Gord's™ to their wheels, bumpers, and tanks before driving into snow storms on chemical drenched roads, AND LEAVE THE RESIDUE for extra protection. The next truck wash resulted in well polished and sealed metals with very little need for polishing. It is possible to polish, seal, and save your metals in 25°F weather! Better than the 100°F + weather we deal with! We love polishing in the COLD! Big trucks + Big chrome = BIG $$$$$$ investments! We use Gord's™ Polish to clean and polish Lexan Motorcycle Windshields without scratching. Gord's™ Cherry Wet Wax will not harm the Lexan either. Here's a few facts about Gord's™. ·Gord's™ is Non-Abrasive; this is not a jewelers rouge or pumice based product. ·Gord's™ is a Soap Based Product. That's why it can be used in such a wide variety of applications. ·Gord's™ contains "No Harmful Chemicals." No Ammonia, either. ·Gord's™ is easy on your Hands, Wallet, & Ride. ·Our average customer uses about 1-16oz bottle in about 8 months. ·With Gord's™ you can Restore, Clean, Polish and Seal, with one amazing product. ·Corrosive Grime, Caliche, Red Clay, or Saltwater will not stick, or dull your shine for months. ·Gord's™ is a PROGRESSIVE polish and your shine gets better, AND EASIER each time. NO constant re-polishing! ·There is no need to polish after EVERY rain storm! You just wash the dirt off. ·Your Long Lasting Shine will be worth the time, effort, and money you invest. Protect the value of your investments with a polish and sealer that works for YOU! After sitting in the heat and salty humidity of the South Texas Gulf Coast, everything still washes right off UP TO 4 MONTHS LATER! 1. Gord's is a Powerful Cleaner, Polish, Sealer all in 1 bottle. 2. Gord's is soap based not a Jeweler's Rouge Based Polish, only Patented Non-Abrasive Materials are used. Other Polishes are up to 15 times more abrasive. 3. Gord's Removes Minor Scratches from Aluminum. 4. Gord's has the Longest Chenical Reaction Lasting Sealer on the market. 5. Gord's has been chosen "Best" Polish/Sealer by S. Texas Gulf Coast Bikers, Truckers, Classic Cars buffs, and More. Corpus has highest Salt Air content in the U.S.
6. Gord's works on Forged & Billet Aluminum, Raw Aluminum, Chrome, Stainless, Copper, Silver, White & Yellow Gold, Titanium, Magnesium, Brass, Galvanized, Fiberglass, Lexan & more. 7. Gord's removes Surface Rust from Chrome, & Stainless without scratching. 8. Gord's makes Diamond Plated Aluminum toolboxes look like Chrome. 9. Gord's removes Asphalt & Tar without hurting or scratching Paint. 10. Gord's removes Oxidation from Fiberglass & Paint without scratching. 11. Gord's removes Salt Water and other environmental stains from your metals easily. 12. Gord's is safe on Lexan and even the Chrome Plated Lexan Grills, without scratching. Clean your Lexan headlights too, removing yellowing off headlights! 13. Gord's Polish has a Long Shelf Life. 12 years +! Gord's Polishing abilities also are not effected by Extreme Cold or Heat. DOES NOT FREEZE! Works well in hot and cold weather! Gord's Polish has a Penny in every bottle to help you mix it up. Check out that Shiny Penny! "MIRROR SHINE EVERYTIME"